I want to make a stand. 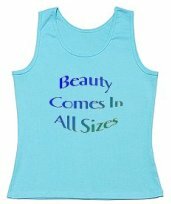 I want to say here that any size is fine, that your body is unique and beautiful the way it is. I wanted to have something positive to say to people with a bad self-image, to those who struggle with eating disorders, and to anyone who will listen. I've had close friends and relatives struggle with eating disorders. I'm fed up with the media, the diet industries, and even a good number of doctors.